My family had a four day stop over in Beijing on our way to my brother’s wedding some years ago. Like typical tourists, we decided to try a roast duck restaurant for dinner. We read the reviews for Li Qun restaurant and thought it would be interesting. The restaurant was located in the heart of Beijing’s Hutong and we soon got lost on our way to the place. After wandering the back streets, we came across some locals who must have seen our confused faces and took pity on us. They spoke in Mandarin, but I was able to make out the word Li Qun. A kind but slightly frustrated man repeated it again and again. I think he also asked if I was Korean. I replied I was Korean, in my very limited Chinese. “Woh han kwoh ren.” Who knew the Chinese I picked up as a child in Singapore would stick with me still. Back then, I didn’t even contemplate that I would also identify as Australian years down the track. He pointed us in the right direction and shouted “Hong Dung!” as we walked away. “Hong” means red in Korean. “Dung” means lantern. We were to look out for the restaurant with the red lanterns. As we drew closer, we started coming across images like the one below. We began following the arrows. Finally we saw the red lanterns outside the restaurant. And the giant sign that reassured us that we were at the right place. It was a busy night so we had to wait outside for our table. My husband and our young son played snap while we waited. Once inside, we were seated on the corner of a small space. The decor wasn’t modern or new, but it had a certain honesty. I liked it. You could tell this was a place that focussed on food. We gorged ourselves on duck pancakes and noodles. It was delicious and worth the wait. The memory is six years old now, but I can still recall it like it was last week. 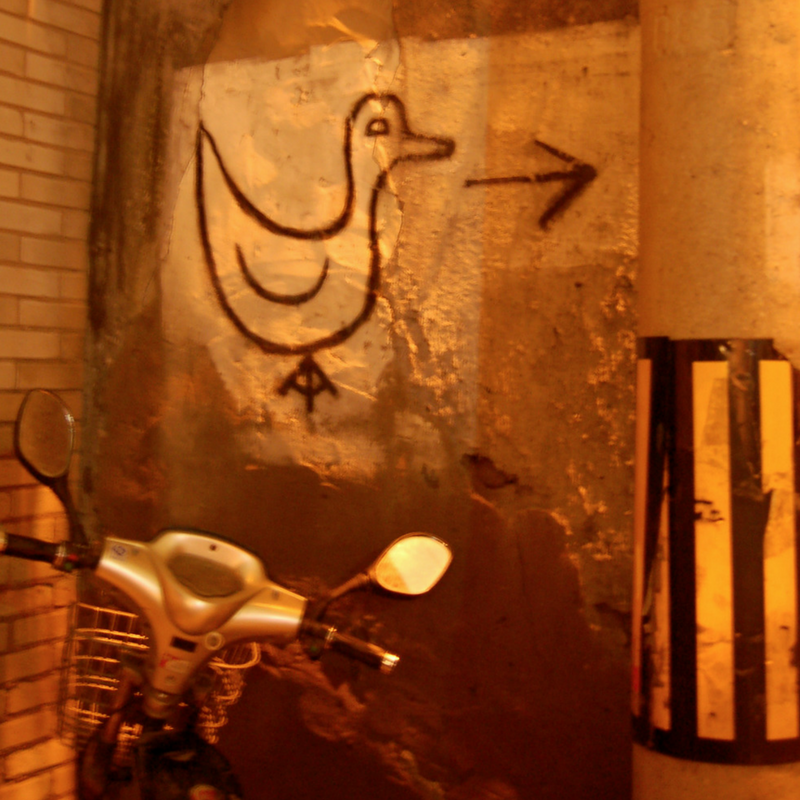 Our first trip to China, wandering around lost in the alleyways of old Beijing and spending the night eating roast duck with my husband and son. It’s cool how sometimes the best trips come from not sticking to a plan, but just wandering around. Nice pictures by the way, they really capture the atmosphere of Beijing’s night life. I also hope the duck was good! Thanks! The duck was delicious! And yes, once you get past the angst of not knowing, it can surprise you with unexpected experiences. Very nice. Great stuff. Go visit my blog my too.